East Louisville Pediatrics is a comprehensive pediatric practice caring for children from birth to adolescence. We are certified as a medical home where our patients can receive their complete care and treatment. This includes a holistic approach to medical care, including advice on nutrition, behavior, diseases and accident prevention. We strive to treat our children and parents as if they were our own. We have two offices to better serve your needs in Crestwood and Saint Matthews. We provide both well and sick care at both sites. Our phones are answered 24 hours a day and one of our physicians is always on call for emergencies. Our office staff begins answering calls for appointments at 7:30a.m. and opens the advice line from 8:30-5:00. All acute illness visits are given same day appointments and we have Saturday morning hours at the Saint Matthews office. 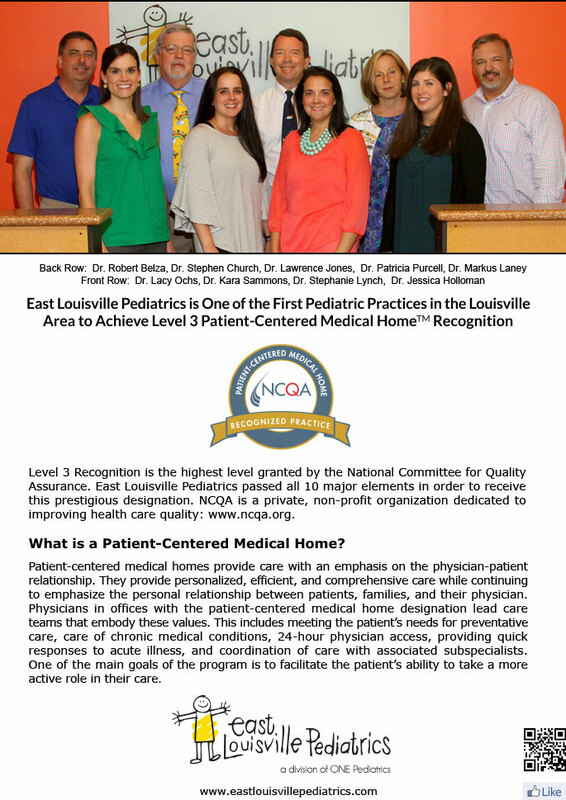 East Louisville Pediatrics offers a free evening open house each month for expectant parents to meet our physicians and see the office. Please call us with any questions or for a reservation to our open house. EAST LOUISVILLE PEDIATRICS IS NOW ADMINISTERING FLU VACCINES. PLEASE CALL OUR OFFICE TO SCHEDULE A SHOT ONLY APPOINTMENT. MONDAY -FRIDAY 9 A.M. TO 11:30 A.M. AND 1:30 P.M. TO 4:30 P.M.